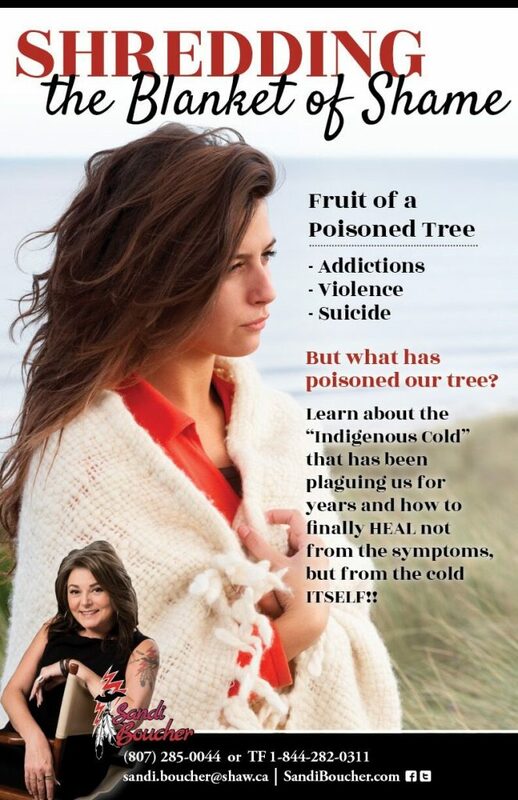 Internalized Oppression is a reality for the Indigenous peoples of Canada. One of Sandi’s NEWEST seminars (offered for the first time in 2017), this seminar involves self-reflection, self-acceptance while encouraging self-improvement. Participants are introduced to both “The Blanket of Shame” a published piece written by Sandi Boucher on this topic and the metaphor known as the “Indigenous Cold” which highlights how we already accept that with a cold comes sniffles and body aches and how we must now realize what symptoms come with the oppression that Indigenous peoples have felt for generations, with the same lack of guilt or blame we give to a bad cough. Participants complete a quiz, assisting them to recognize and identify the symptoms that their communities are experiencing, along with those they themselves are struggling with. Once identified, the largest segment of this seminar is focused on the six “medicines” that fix the Indigenous Cold with the participants having the opportunity to come up with plans on how they can implement these solutions in their homes and in their families.